Isn't this an adorable party favor? It would also be a very clever hostess gift during the Christmas season. You can make it in about five minutes if you have all of the materials on hand..
Large plastic plant liners to invert as domes. Pine or cinnamon candles from The Dollar Store. Snap-on snowmen, or whatever other type of embellishments you might want (Santas, reindeer, elves, or owls, etc. 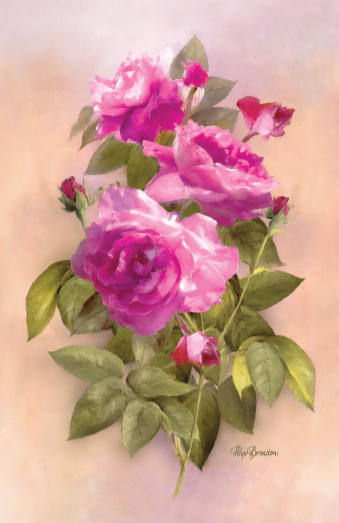 You could use nests, birds, and flowers for Christmas or other occasions. I wanted mine to resemble snow globes. A measure of coordinating ribbon to tie around the colander. If you use the dome and plates, which you don't have to, place rolled glue dots on four sides of the bottom of the dome and secure it to the plate. Can you tell me about a clever party favor you have seen or made? What made it special to you? Are you ready to make a really fun Christmas cookie? These cookies are sure to bring a smile to the faces of those you serve them too. to emphasize the snowy effect. Below is the recipe I used. I am also going to share with you what NOT to do! I used Betty Crocker's Sugar Cookie Mix in the pouch. Yep! They weren't from scratch, but, they tasted good, and most importantly, they worked! Follow the directions on the back of the package. Form the base of the cookie into the shape of a golf ball. Next, form the rest of the dough into balls about the size of large grapes. Leave them in that shape, don't press them down. Bake the cookies for about 8-10 minutes until edges start to turn golden brown. Check for to see if they have thoroughly cooked. Remove the cookies on the parchment paper to a counter top service and let cool, . When the cookies are cool, mix together one bag of powdered (Confectioners) sugar with about 1/3 cup of milk. Mix together with a mixer. Add milk if it is not thin enough. You want a consistency that you can drip over the cookies. Frost the bottom cookie by spooning frosting over the cookie to cover it. Let it drip over the edge. It adds to the melted effect. Add the baked smaller balls which have flattened somewhat to the top of the cookie and off to one edge. Cover it with frosting too. Decorate as you wish. I used small gold candy balls placed fairly close together for the eyes, two M & M's for buttons for buttons, a purchased holly candy embellishment and the first time, the orange part of a piece of candy corn, trimmed. It looked great, however, because I had to make them two days in advance, they melted and spread into the cookie. I had to completely dig out that piece of candy and the frosting, and re-frost it with a firmer frosting I had on hand for cupcakes I made. Then I cut orange M & M's in half and laid then on the top, right before serving. I think the candy corn noses looked better. I would use them again next time, but I wouldn't put them on until just before serving. Sprinkle the cookie and the plate with cake glitter. Have fun! I know the people you serve these to will be delighted. in anticipation of the wonderful friends that soon would be there. My royal friend, Shannon, with her Christmas cracker surprises. Notice the crown made out of tissue paper! We all received one of those inside! What GREAT sports my friends are! They actually wore them...for a long time. Everyone received a different color. We had so much fun reading and laughing at the fun jokes that were included. I thought this gift would bomb, but surprisingly, we all had a lot of fun with it. Some of the party girls! I love all of these woman so much. THEY are gifts from God to me! The picture above shows how I gazed upon my table for days before my guests arrived. The colander with the candle was to be their party favor to take home, so I had to remove them, and set them aside to give them to my friends towards the end of the evening. I'm pretty sure they were ALL delighted! That the colanders were not only cute but also a practical gift was a good idea to me. How many times do you wish you had a small colander to rinse berries, etc.? The cinnamon scented candle can be used anywhere. The rest of the items were simply, but whimsically, embellishments to make it look CUTE! See the finished version below towards the end of this blog post. I could hardly wait for my guests to arrive and partake! Large snowflakes were strategically place around the table and hung from the chandelier with care. Be careful of hot bulbs when hanging snowflakes though! I burned my finger not keeping this in mind. Do you notice the red striped theme blending with the snowman theme? When my guest arrived I had placed the snowflake name tags on their ruby red plates to welcome them to the dining table. The napkins were placed inside small snowman stockings found at Home Depot. (AKA Cream of Asparagus Soup) with bell pepper Christmas tree cut-outs. This was a really delicious salad made with Romaine lettuce, avocado slices, pomegranate seeds, candied pecans, and snowflake and star jicama cut outs. Served with Brianna's Real French Vinaigrette Dressing, the one with the artichoke artwork on the label. I served my guests an almost authentic Swedish Meatball dinner. It was absolutely fabulous, if I do say so myself. It was sooooo easy to make. Did you know in Sweden they mix all of these ingredients together and eat it that way?! I had this very dish in Stockholm this summer. It was amazing there and I duplicated it very easily. 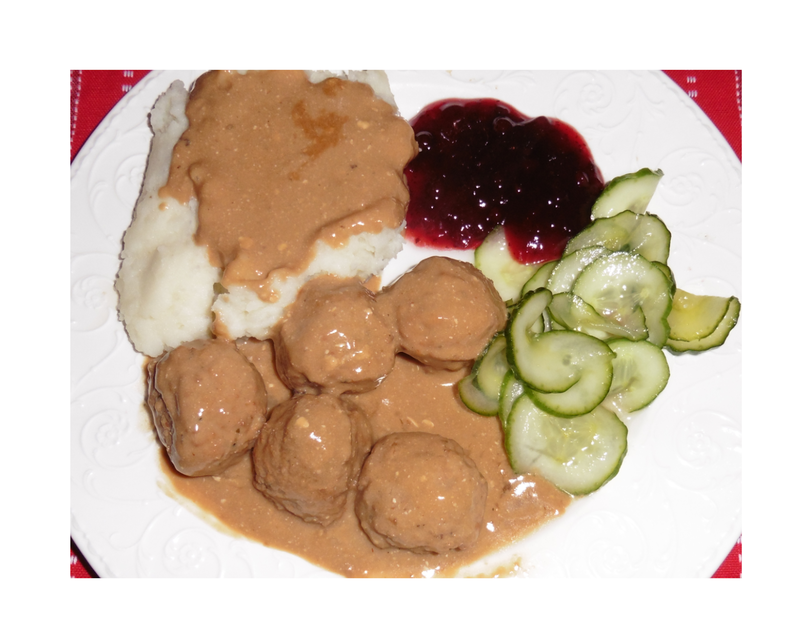 Accompanying the mashed potatoes and meatballs were pickled cucumbers and lingonberry sauce. So good! I've read the Swedes add those two ingredients to many of their dishes. 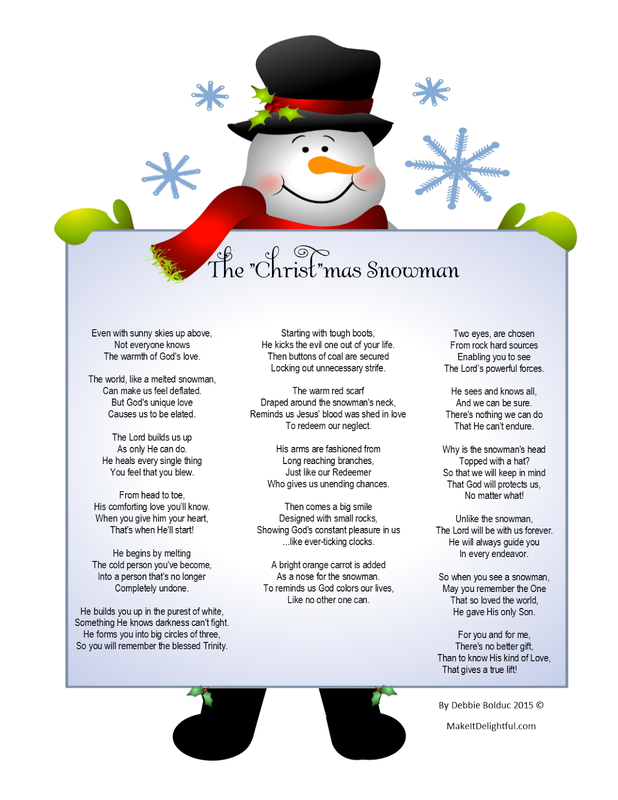 After our main course, I gave each lady a melted snowman cookie and a copy of a poem I read about how the world makes us feel deflated, but God makes us feel elated. My friends seemed to like it. In case you missed it on my previous post. Here it is again. Here's a close-up of the melting snowman sugar cookie. I was beyond excited to serve them their Grand Finale Snow Globe dessert of an Ina Garten (Barefoot Contessa) coconut cupcake with a snowman cheese spreader inserted into the cupcake. I then topped it with a snow globe dome and wrapped a ribbon around the base. I saw similar ones on Pinterest, however, they were fashioned with gelatin, which I wasn't brave enough to attempt! I opted for a sure bet and less time. That's about the cutest darn dessert I have ever seen. So last, but not least, is the domed colander party favor. I hate to admit it but it was so inexpensive to make. The colanders were $2 at World Market, the cinnamon candles came from the Dollar Tree store. I ordered the mini pine artificial wreaths from an online craft store and purchased the medium and small snowflakes at Hobby Lobby. I believe, all in they cost me about $5 each to make, but oh what a unique take home gift to remember the theme of our party. This was so much fun! I'm ready to do it again! So tell me, what are your plans for Christmas celebrations this year? Let me hear from you. I'd love to know what you are up to. I love it when you comment on my blog. Makes this all worth the effort. 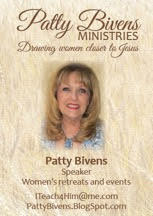 God bless you as you celebrate our Saviors birth. 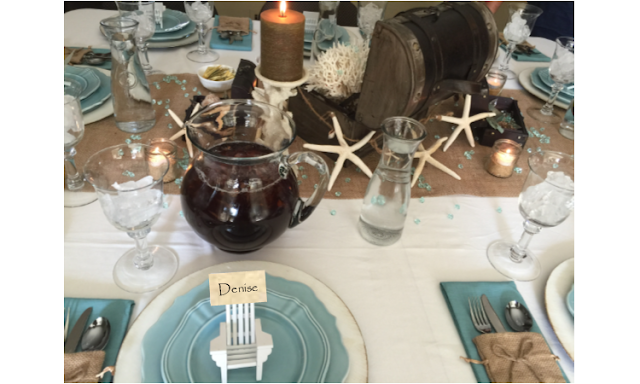 I am very excited to share the details of a CHRISTmas party I hosted on Saturday for seven very dear friends. I really do wish I could invite all my friends, but it was not possible this time. It was my desire to feature a snowman theme as I have a set of the cutest snowman plates and props purchased from Pier 1 Imports in the last few years. Then, I found the most spectacular dessert to serve that tied in with my theme and I was on my way to eating, thinking, dreaming, seeing, and every other sense of pursuing snowmen, snowflakes, and snow-look everything! Before I begin to show you the tablescape, menu, and various other elements of the evening, I want to start out by focusing on the meaning of CHRISTmas with a poem I wrote to share the gospel in a clever way. Here it is! No matter what time of the year you plan to get married, Southern California is the perfect place to host a wedding, and the zenith of wedding venues is found at The Fairmont Grand Del Mar, in San Diego, California. The weather is nearly perfect year around and this property possesses breath-taking views and close proximity to the Pacific Ocean as "icing on the cake" as they say. 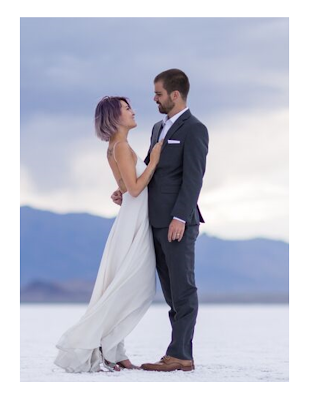 Come with me as I highlight what a grand wedding yours can be. As your friends arrive at the Fairmont Grand Del Mar, they will be mesmerized by the visual promise of a wedding they will not soon forget. 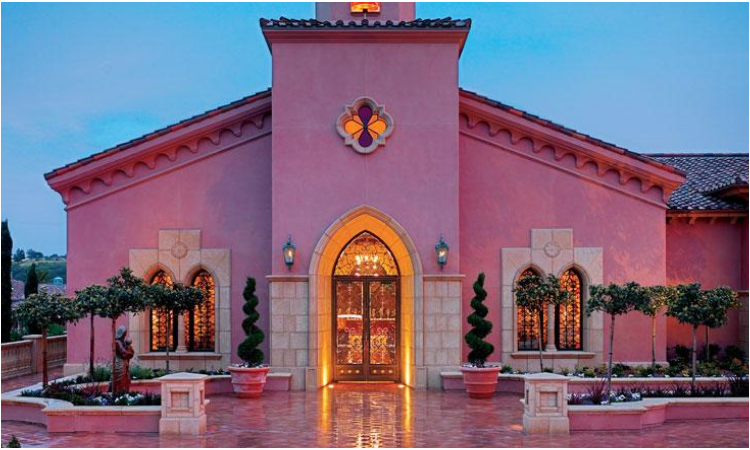 This is an all inclusive, unparalleled wedding and event venue! The southern California palm trees set the stage for a beach-themed wedding. Your guests may reserve a luxurious room to enable them a worry-free evening when the festivities come to a conclusion. Arrive a day or two early and the men can play a round of golf on one of Southern California's most beautiful championship golf courses while the ladies can indulge in Five Star Spa and beauty services. 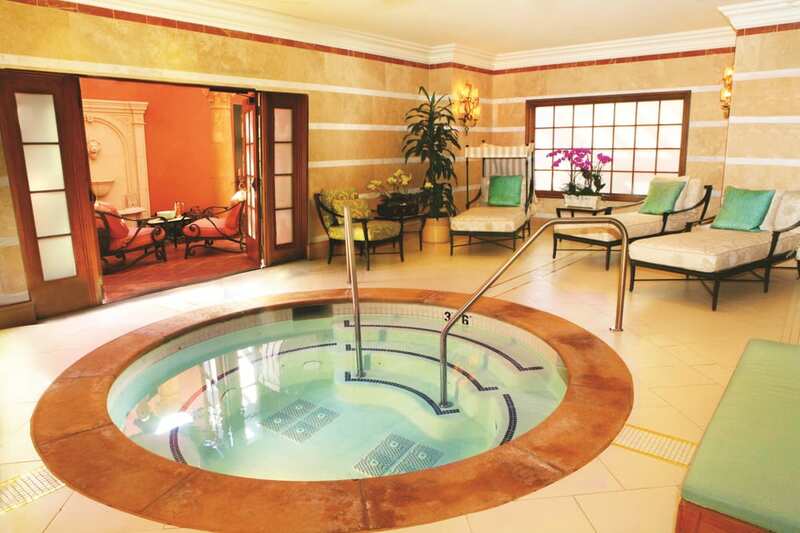 The immaculate Spa can accommodate your entire wedding party. Guests will be ever so patient as you endure the timeless tradition of the taking of the wedding photos when they can find repose with scrumptious Fairmont appetizers and a classic, refreshing beverage. While mingling with mutual friends and meeting new acquaintances, your guests will discover that the views are spectacularly part of the entertainment. Adventurous eyes will always find a place to be delighted within the property. 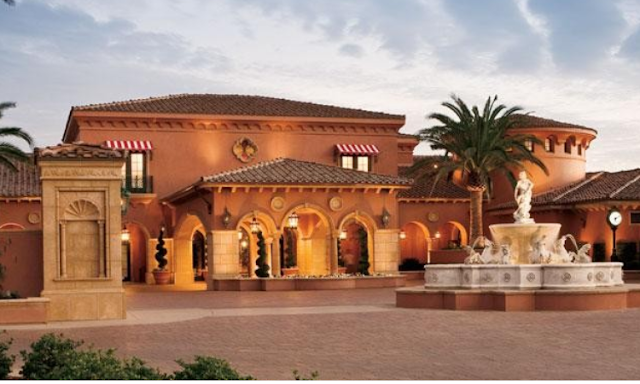 The capacity for a large gathering is no challenge for the staff at Fairmont Grand Del Mar. With it's impressive location and the ability to host from 20 to 2,000 wedding guests, this immediately becomes a top contender in your search for the perfect wedding venue. 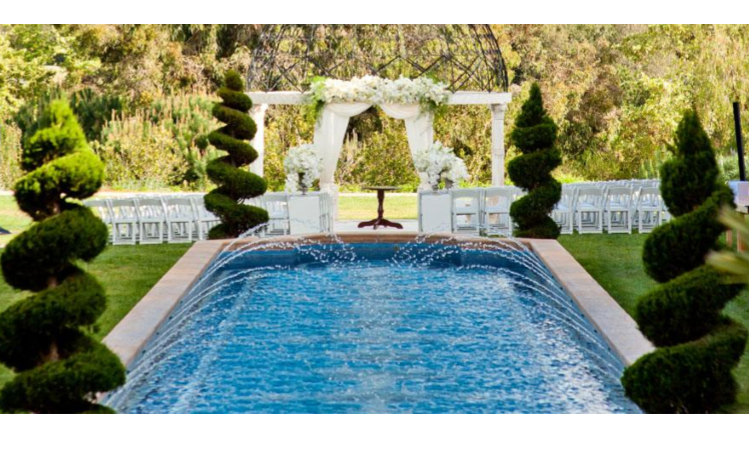 Should your dream wedding necessitate a smaller more private space, Fairmont Grand Del Mar offers their Reflection Pool area where guests can move straight from the ceremony directly to the banquet. You will discover that there are many unique, impressive places within the property to implement the various stages of your wedding venue. Choose anyone of the banquet locales to bring the magic of your personal wedding alive. This photo does not appear on mobile devices. There are a variety of spaces to choose what highlights your plans best. 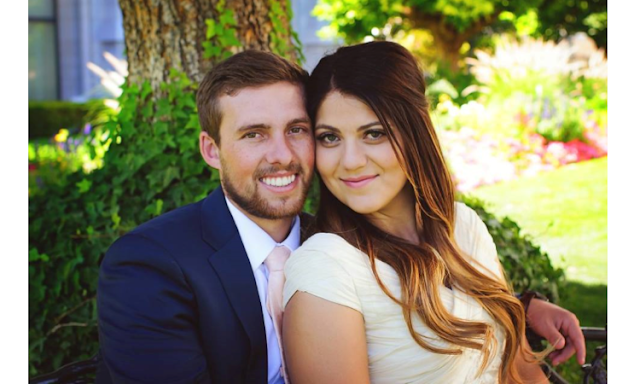 Do you need the assistance of a wedding coordinator? No problem! The Fairmont Grand Del Mar has a complete staff of knowledgeable professionals that can assist you in accomplishing your personal requests. 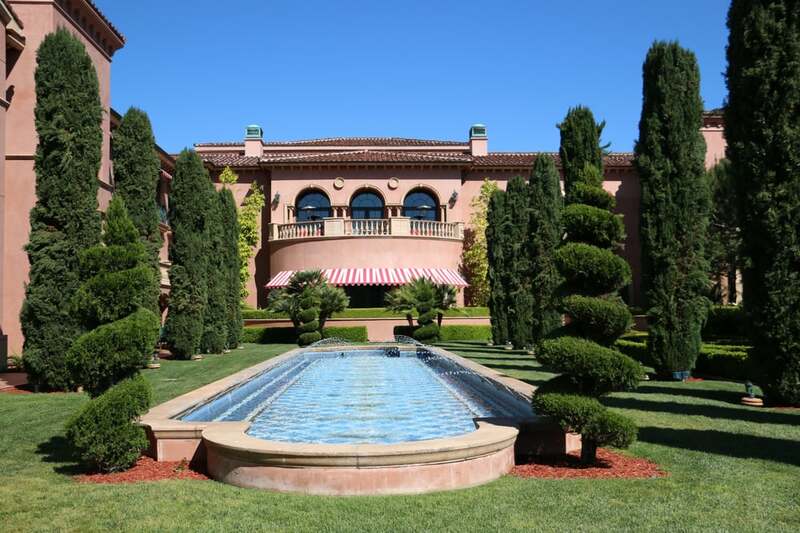 When your guests arrive, they will be directed to your perfectly prepared venue within the Fairmont Grand Del Mar to launch your wedding or reception. Delightfully offered to them will be signature cocktail or sparkling wine blended with Blue Curacao for a celebratory libation. Don't forget to have the bartender add a few blue colored sugar rocks at the bottom for a whimsical effect! Knowing that the Fairmont Grand Del Mar staff is attending to every detail, the bride and groom can rest assured that their dreamed about day will be nothing short of magical. Upon receiving their introductory signature beverage, your guests may discover cozy, seashell bedecked small tables strategically placed around the perimeter of the reception territory offering romantic or restorative areas to enjoy. 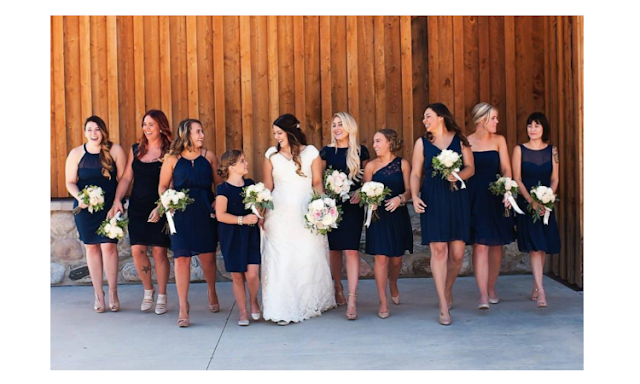 Your treasured family and friends will find tranquility during the stages of the wedding event while savoring their chilled glass of one of California's best Chardonnay's, a glass of bubbly, or another favored beverage of choice. After the sun sets, the candles will be lit on the creatively set tables for that romantic look you long for. Relax by the water with friends, an appetizer, and beverage of choice. A well-appointed table awaits the lucky wedding party and attendants. A bit more lavish than the banquet tables at large, a special tablescape can be designed for the wedding party and attendants. Begin with sand-toned tablecloths. (Burlap works well for this look.) A specially chosen fabric is used upon this table to display the look of a sandy beach. (Chargers are crafted from rock-design floor tiles from Home Depot and adhered back to back with the included adhesive.) This foundation will now host the remainder of the dining essentials. Rock and water toned appetizer plates are set upon seashell embossed dinner plates. 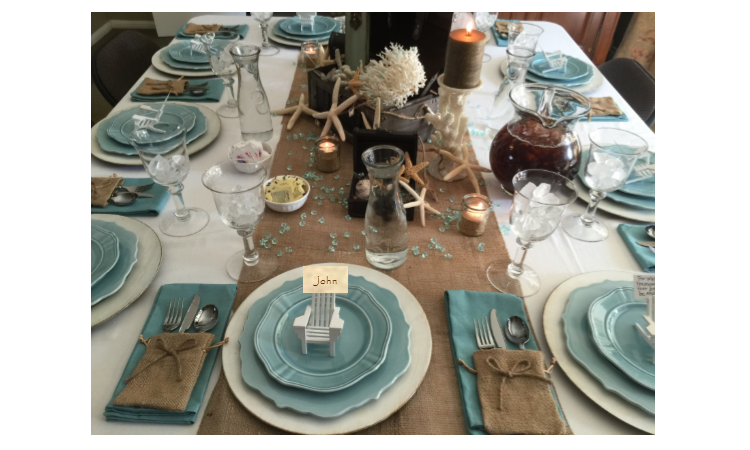 Embellish your setting with ocean blue napkins to make a visual splash on your seascape table. Your guests will dine as though they were on the beach with sparkling crystal that brings out the essence of the sparkling ocean water along with the hews of the glimmering ocean water itself in the sea blue water goblets. A variety of beachy elements join in the event by being themselves in all their beauty. Your guests will be continually enchanted with so many places for their eyes to gaze upon while dining. When the candles are lit, your table is transformed to a warm beach setting. 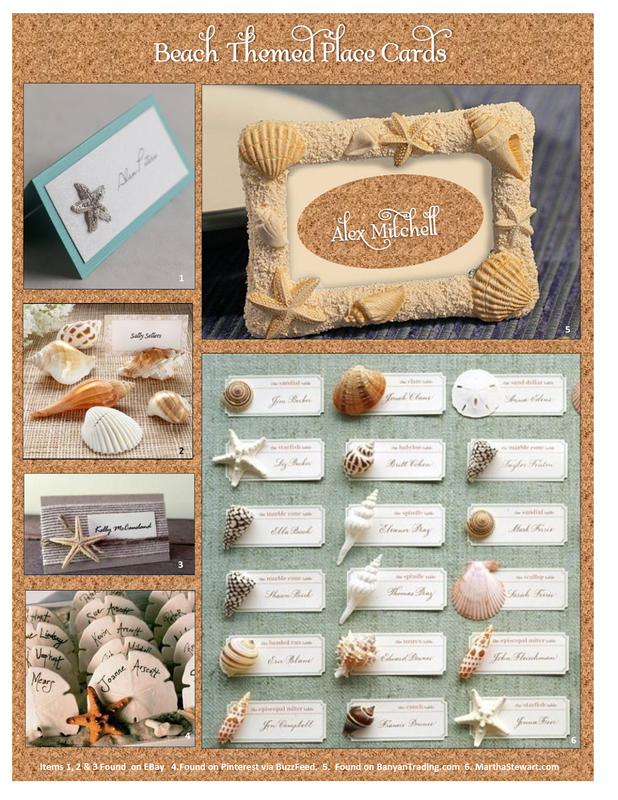 The wedding party table could be set with personalized seashell and starfish place cards or miniature pool chairs that hold name tags as seen in the banquet tables below the next picture. The wedding party and attendants table will welcome your guests with more of a keepsake place card enclosed in the form of message in a bottle at the table of honor. As your treasured friends and family, they may secure them as a souvenir of happy memories created at your majestic wedding event. How lovely your main banquet area tables can be with all kinds of beachy elements. Did you notice the treasure chests? As an encore to the salad, impress your guests with the best Lobster Bisque in Southern California! Here, the seashell bowls are reserved for the wedding party table. Your remaining guests will be equally impressed with their serving in the Fairmont Grand Del Mar tradition. Add a bit of whimsy if you wish with fish crackers within the soup. Notice, your guests will be so impressed, they will be taking photos of the tablescape as well as each other and you! The menu selections are quite extensive at the Fairmont Grand Del Mar. For your land lubber guests you could opt for a delectable leg of lamb accompanied with new potatoes and broccoli spears. Of course it will be embellished with a tropical flower! With an ocean themed wedding, it only comes natural to offer the option of a Maple Soy Salmon creation paired with Wild Rice casserole topped with freshly steamed spinach. Of course, this will be served with a variety of artisan breads. Vegetarian choices are also available. Whether you opt for small individual sized desserts such as a chocolate molten cake adorned with white chocolate seashells, or, an unforgettable ocean-themed wedding cake, you will find that Fairmont Grand Del Mar can accommodate all of your custom requests. 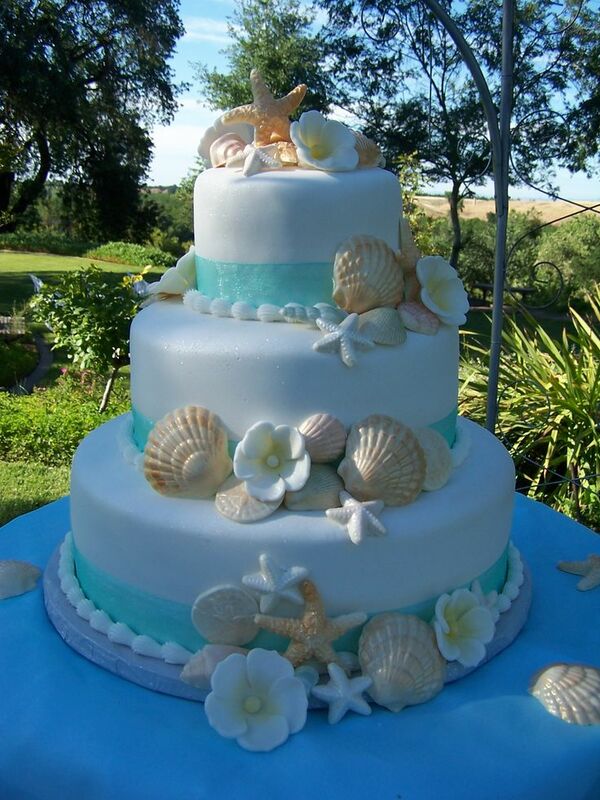 one-of-a-kind ocean themed wedding cake?! Should you opt for a water-themed tablecloth rather than a sandy one you can elevate the wow factor with Mylar scalloped sheets trimmed around the edges to appear as though you were dining in a glass bottom boat. This could be positioned on top of a sandy look tablecloth to emphasize both water and sand. Another type of bottle to hold a name tag or wedding favor. Remember to tie with a raffia ribbon, attach a seashell, and fill it with sand and diminutive sea shells. ...and perhaps, you may choose to gift your bride's maids with an ocean-themed pin or necklace as a special memento of your treasured friendships and wedding. You have now hosted and spent the most memorable evening of your life at your magical wedding and reception. It's time to bid your guests good-bye and recline to the wedding suite reserved just for you at the unparalleled Fairmont Grand Del Mar. Recline to a well-appointed suite with a fabulous California view. Enjoy a spacious living room as you relax and refresh. 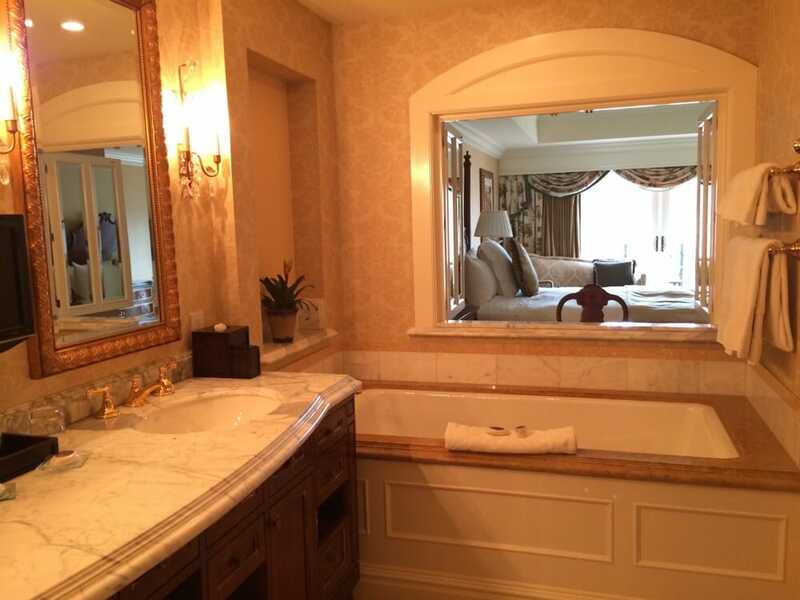 A luxurious bathing area welcomes you. Awaken on your first morning as a married couple and indulge in tropical banana, pineapple and coconut waffles delivered to your suite to start the first day of the rest of your lives with pure deliciousness. Enjoy Kona coffee with it and a glass of fresh squeezed California orange juice. here are a few elegant wedding essentials you may find of interest. 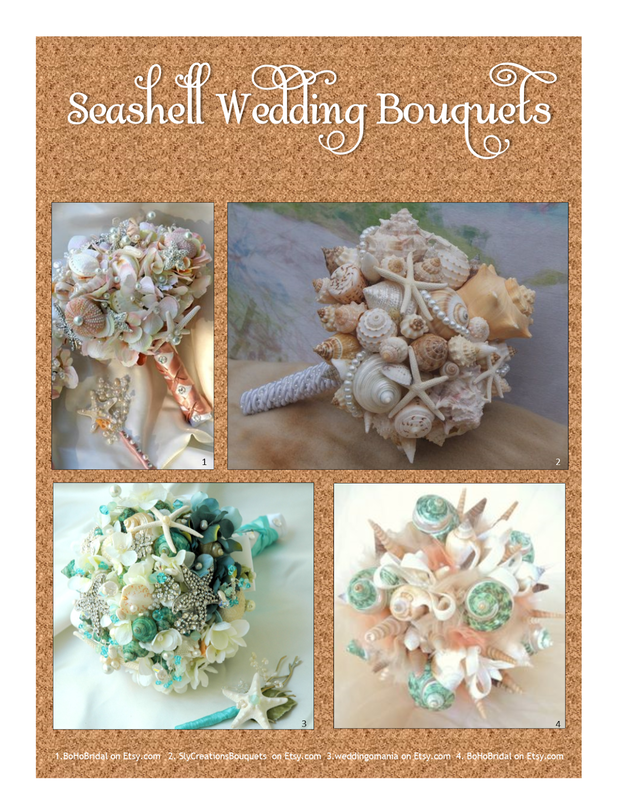 Unlike other weddings, a beach-themed wedding goes beyond the traditional wedding bouquet with the extraordinary presentation of seashells, starfish, sea glass, sequins and ribbons. 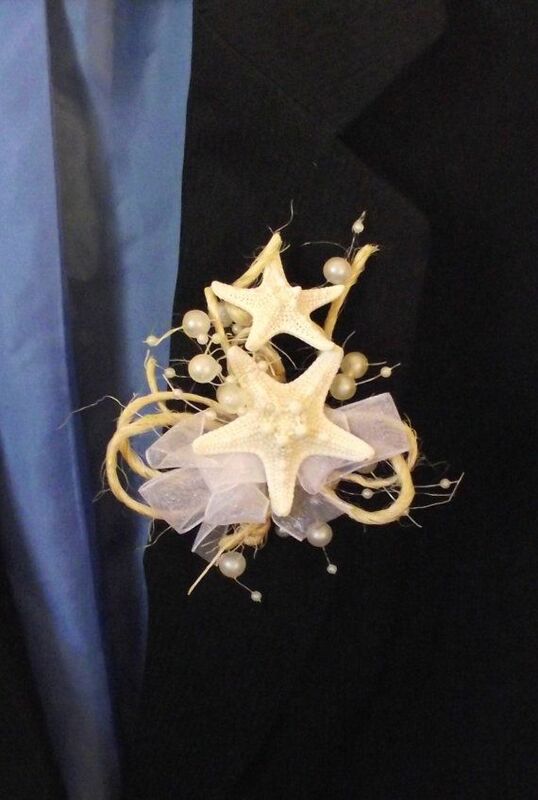 Your groom and groomsmen will amuse with an amazing starfish and pearl boutonniere! Every event is handled professionally with attention to your personal preferences. Every newlywed and guest is guaranteed an experience of a lifetime. 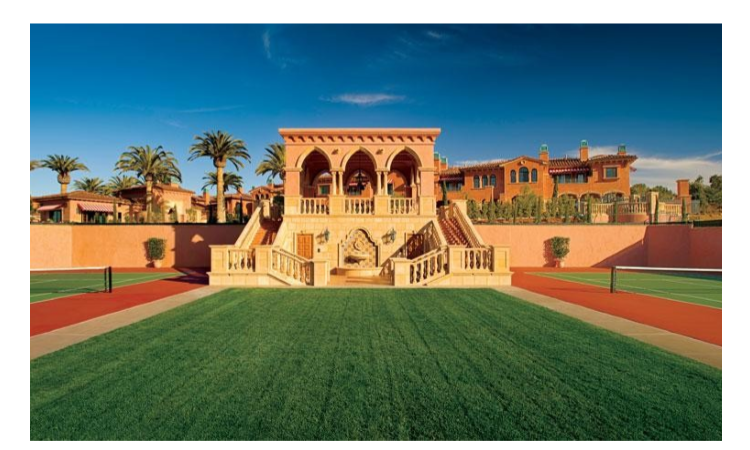 I hope you have enjoyed the tour and will consider recommending the Fairmont Grand Del Mar to anyone who should be smart enough to ask you where a dream wedding location in Southern California is. I have attempted to give credit to any entry not designed by me. If I have failed in some way, please let me know and I will make whatever corrections are required. Fairmont Grand Del Mar photos used by invitation. Thank you, Alex Mitchell, for inviting me to share this special hotel with the world.